Find the answer you’re looking for! Do Airgloss products clean the air? No. Airgloss devices have no built-in air purification filters, but they can work with your HVAC systems smartly managing ventilation whenever it’s needed. What area does Airgloss product cover? Airgloss sensors can cover up to 80 square meters, although much depends from the environment they’re placed in. Airflow can be restricted by the presence of walls, closed doors and partitions, influenced by heavy pollution sources and change from floor to floor. Do I need to install a sensor in every room? It depends. In residential buildings, we recommend one sensor placed in the most used room, or more than one if the house is very big, or on more levels. For offices, where there are more people, one sensor per room would be recommendable. Can I visualize the data when I’m away? Of course. All the device readings are on the cloud, so you don’t actually need to be near the sensor to visualize the data. You can monitor your environment from anywhere, anytime you want. All you need is access to the internet! Can I use Airgloss products outdoors? No. 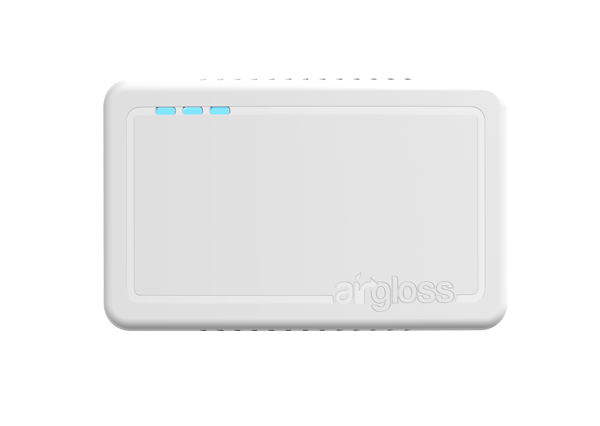 Airgloss sensors are only intended for indoor use, and are not calibrated for outdoor environments. Do Airgloss products have a battery? No, there is no battery needed. All they require is a power supply 12/24V AC/DC (or USB for short time testing use). Airgloss products require a 12/24 V AC/DC power supply. Basic maintenance is. Simply clean the device from dust wiping the exterior with a soft, clean cloth, avoiding water, sprays, feather dusters and vacuum cleaners from getting anywhere near the product. Airgloss devices feature sound notification aboard. This does not mean they are noisy – unless you find yourself in a particularly polluted indoor environment of course. Nonetheless, we have also provided the chance to disable sound notifications, so that no noise will disturb your sleep or concentration. No, it’s not. Radon requires continuous monitoring in the basement, where it is released and concentration is higher. We’re working to release a standalone unit to be installed nearby, to properly monitor radon sources and better find a way to avoid it from spreading in the whole building. Can I substitute my Carbon Monoxide alarm/detector with Airgloss products? No. Airgloss products are not suitable substitutes for CO alarms, standalone gas alarms nor toxic-gas detectors. Our sensors are designed for HVAC and building automation systems and are not specifically intended for safety in hazardous environments and life-critical situations. Yes, in order to keep the device connected you will need a Wi-Fi 802.11b/g/n @ 2.4 GHz. You don’t need to be connected to the Wi-Fi to access the app, instead, any other internet access is fine. Do Airgloss products handle HVAC systems? Yes. 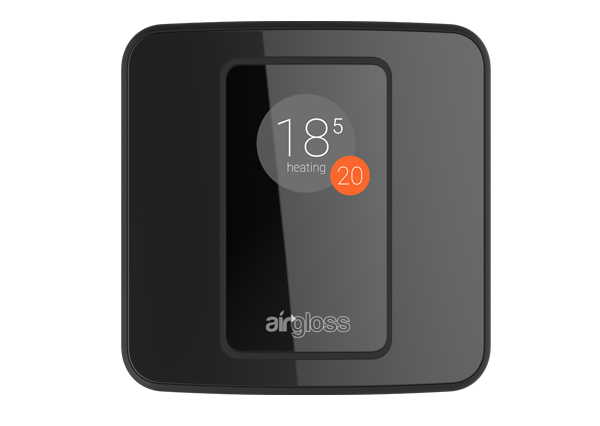 Airgloss products are compatible with the majority of common HVAC systems and are equipped with air ventilation management and wired/wireless BACnet interface. Are Airgloss Products compatible with Google Home, Amazon Alexa or Apple Homekit? We are currently working on integrations with Google Home and Amazon Alexa. Apple Homekit will possibly be included, too, as well as more systems in the future. Do I need to set up an account to use my Airgloss products? 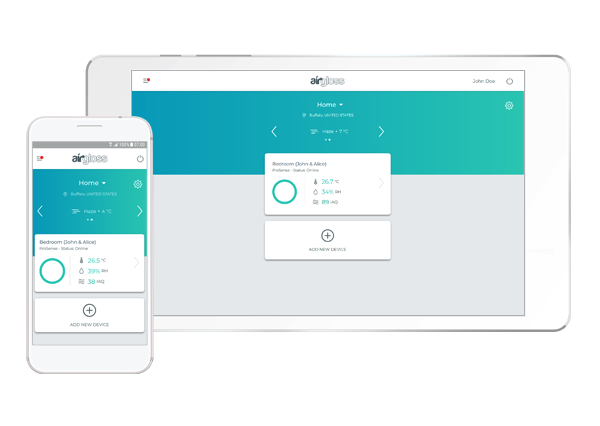 Yes, in order to install your product and visualize device data, an account is required on our Management Platform, allowing you to access both online and via app. Registration is completely free and gives you full control over your Airgloss products. All you need is a working email address and a safe password! Yes, you can! Simply open Airgloss app or online platform, tap the Menu icon on the left, tap Account and select Email. Enter your current account email and the new email address, and confirm to save your changes. All email communications will now on be delivered to the new address you specified. Your account’s password should never be shared with anyone. Still, you may want to grant access to your family, friends or co-workers to visualize device readings. That’s why we implemented a handy Access Sharing solution, that allows you to invite anyone you want to join in. This way, each person will be able to sign in with their own personal account and securely visualize or manage the Airgloss device(s) of your choice. Is it required to install Airgloss App? Yes, Airgloss app is required in order to install your product. After your device is set up, you do not strictly need the app anymore. The web and mobile platform is also good for monitoring and control of your product, although we strongly advise using the app both for a better user experience and to receive push notifications directly on your device, always knowing what is going on in your environment. Where can I find Airgloss App? You can download Airgloss App on both App Store and Play Store. Where do I place my Airgloss product? Airgloss products should be positioned on indoor walls, preferably at eye level and in a room that is frequently used to ensure correct sensor readings. Keep a minimum distance of 3.3 ft/1 mt from the floor and ceiling and avoid placing your device next to windows, heat (direct sunlight is included) or pollution sources or in enclosed areas. Make sure your Airgloss product is positioned at least 1 ft/30 cm away from any furniture, shelf or object that may block a regular airflow. How do I install my Airgloss product? Wall installation, if not accounted for by a Qualified Installer, is covered in detail in the manual you can find inside the product’s packaging. In order to setup your Airgloss Product, you need to download Airgloss App, available on App Store and Play Store. When you download the app, you may have to create an account if you don’t already have one. After you access, the app will ask you to create a new building first (by clicking on ‘Add building’). When the new building is all set, the app will guide you to install your device (by clicking on ‘Add new device’). In this phase, your smartphone needs to be connected to the Wi-Fi (2.4 GHz) for your device to pair. Select the device you want to install. Device authentication will then require you to provide the Serial number and Auth code you can find on the label on the back of your device. If your device is ready for connection, the blue led lights will blink continuously. In case some time has passed and the lights have stopped blinking, try disconnecting and reconnecting the Sensing unit from the Wall mount plate, and make sure that the lights start blinking. Your device needs to connect to your Wi-Fi in order to work. Your smartphone has to be connected to the same Wi-Fi you want your sensor to be connected to, in this phase. Network name will then appear pre-filled, and you will only be required to insert the Wi-Fi password in order to pair the device. Pairing will not take long, unless some errors occur. After your device has network connectivity, the app will ask you to provide information about the room it is placed in and a custom label of your choice. You should see your device connecting after a few seconds. Well done! What happens if I move the sensor from one room to another? Moving your sensor inside your building is no problem, provided it stays connected to the same Wi-Fi. In case you need to switch it to a different Wi-Fi, read here. I need to switch my sensor to a different Wi-Fi. How do I do that? In order to connect your device to a new network, you need to un-pair it from your account, first. Make sure the device is online. Then, open Airgloss app or online platform, tap the Device you want to remove and enter the Device settings menu (the wrench icon on the top right corner). Now tap Remove device and enter your account’s password to verify the removal. Assuming you just want to move the device or change the Wi-Fi connection, make sure you don’t accidentally delete historical data: double check that the checkbox on ‘Remove data’ is not selected. You are now able to start the paring process from scratch, selecting the Wi-Fi network you want. I tried several times to setup my device, but it keeps failing. What can I do? if you have several Wi-Fi networks in your place, try doing the pairing procedure with the sensor and the phone near the access point/router. If all else fails, contact us at support@airgloss.com, providing a screenshot of your error(s) and a brief explanation, including devices led stats. I removed my sensor, but the pairing will not start. What do I do? In some cases, as for example when you remove the sensor from the app when the device is offline, it still remains locked to your profile and a new pairing seems impossible. To solve this issue, you have to reset the device. Just power the sensor (via USB cable) and press the Reset button (as shown in the Installation Manual, inside the box of your device) on the back side of the Sensing unit. You may require a pen or something similar, as the button is recessed. The blue led lights should now start blinking repeatedly, meaning the device is newly ready for pairing. If you wish to delete your account, just open Airgloss app or online platform, tap the Menu icon on the top left corner, tap Account and finally select Remove account. If you have already created one or more buildings, you will have to remove them and all associated devices before deleting your account. Then enter your account’s password in the form to verify the removal. All your data will be cancelled, and the account will not be retrievable anymore. What if my device breaks or stops working? Airgloss devices come with a 2-year limited warranty. Please, contact us at support@airgloss.com. To claim a refund, please contact us at support@airgloss.com. Stay updated on Airgloss and receive the latest news! ©2018 Airgloss all rights reserved. You will receive occasional updates on Airgloss, events invitations, important news and infos about product releases. Most of all, we promise not to be spammy! Airgloss will use the information you provide on this form to be in touch with you and to provide updates and marketing. By selecting the boxes below you confirm your acceptance to receive marketing communications from Airgloss.